After significant tooth loss, use of prosthetic appliances such as dentures or partial dentures allow for the regained functionality and confidence of a full set of teeth. The All-On-4 dental implant system has been in development for the past 20 years as a permanent replacement for dentures. At its most basic, the All-On-4 technique involves securing a single prosthesis containing up to 12 teeth onto four surgical dental implants, and is regarded as a total mouth rehabilitation treatment. Interested in All-On-4? Have you heard about Permadent? All-on-4 was developed by Portuguese dentist Paulo Maló alongside Nobel Biocare as a treatment for patients with significant tooth loss who are not suitable for individual implants. The four implants are implanted into the part of the jaw where the bone is most dense, making the success rate for the treatment higher. 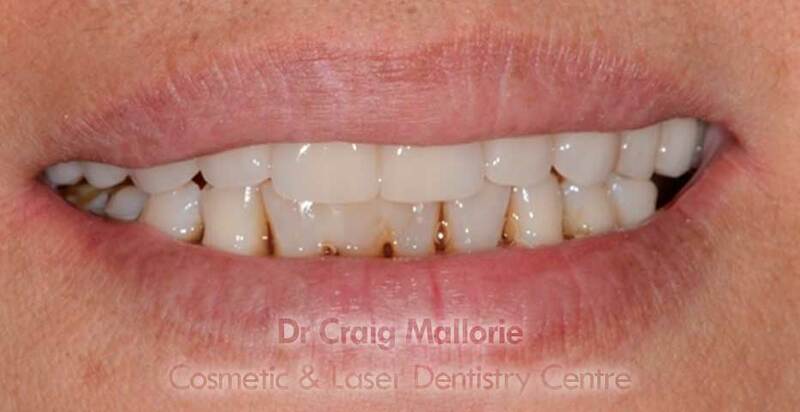 At the Cosmetic & Laser Dentistry Centre - clinical work in implant dentistry, including the All-On-4 method. For more information, please phone the centre 03 9500 2084. 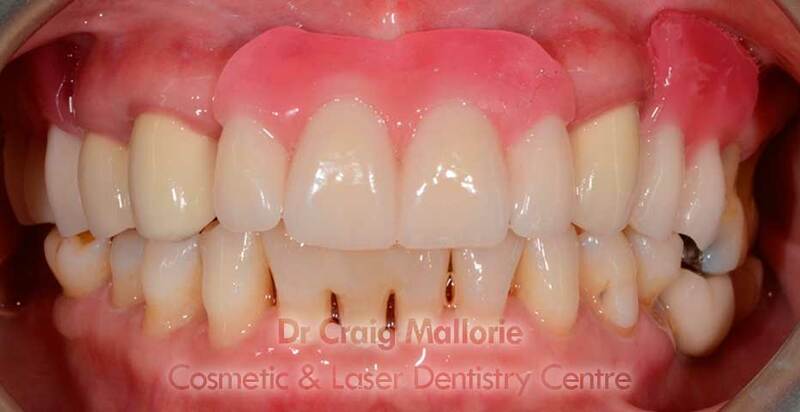 Patient presented with many missing teeth, showing poor prognosis for the remaining teeth. 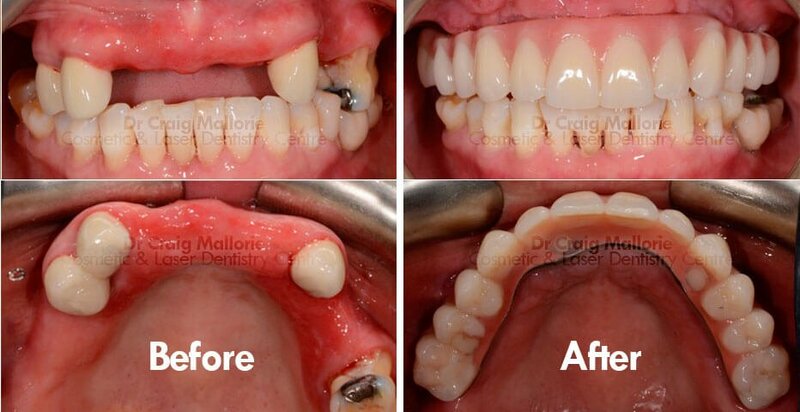 After considerations and discussions regarding available treatments, suitability, risks and costs, the All-on-4 treatment was selected to replace the entire top row of 12 teeth. The few remaining top teeth were unstable and in very poor health, and would not likely last much longer. The decision to extract the remaining teeth and opt-for an all-on-4 permanent appliance. Before any extractions or treatment, the patient was given a live example and plan of the work to be completed in the mouth. 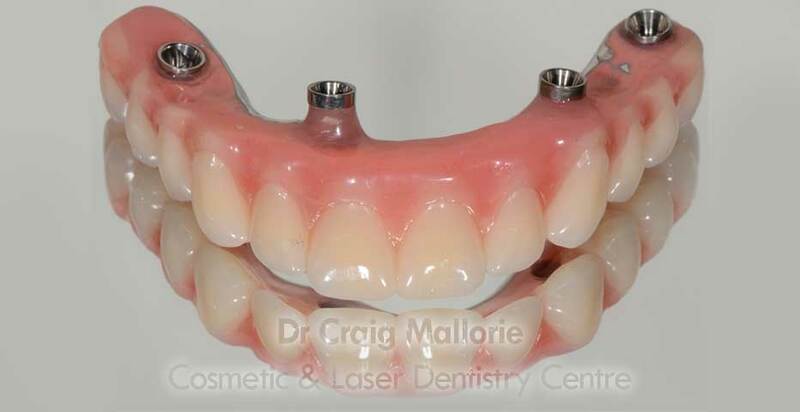 The final All-on-4 bridge is fabricated by the dental prosthetist. 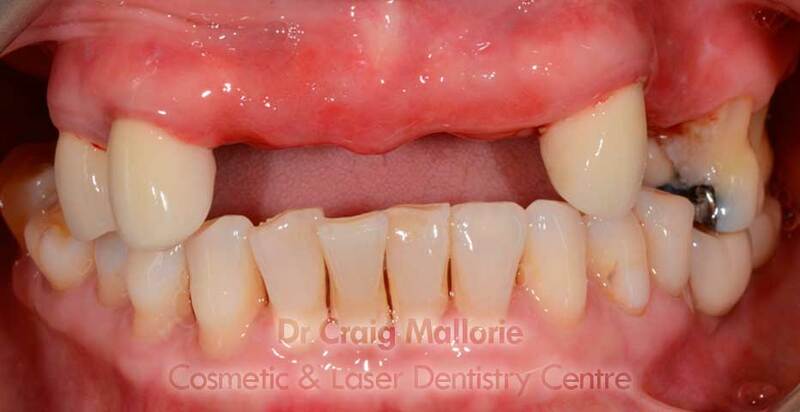 It demonstrates how 12 prosthetic teeth are to be fixed to the jaw using only four dental implants. The treatment involves creating four points where the bridge will be attached to, which are surgically implanted into the bone, and the bridge is fixed onto these four implants. The patient undergoes carefully planned surgery which makes use of 3D scanning technology. The remaining top teeth are extracted and the four implants are inserted. 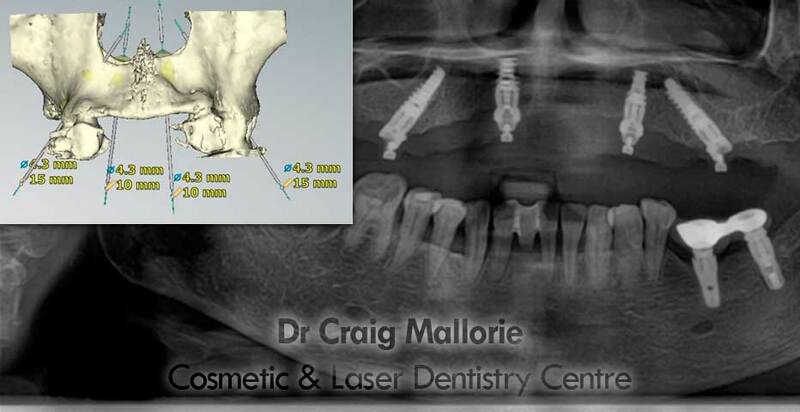 The next day, the bridge is fixed onto the implants. Please note: the implant crowns on the bottom right of the smile were completed overseas and clearly do not fit this patient's mouth or provide functionality. These will be remade to fit the mouth and bite correctly by Dr Mallorie once the all-on-4 surgery has healed. 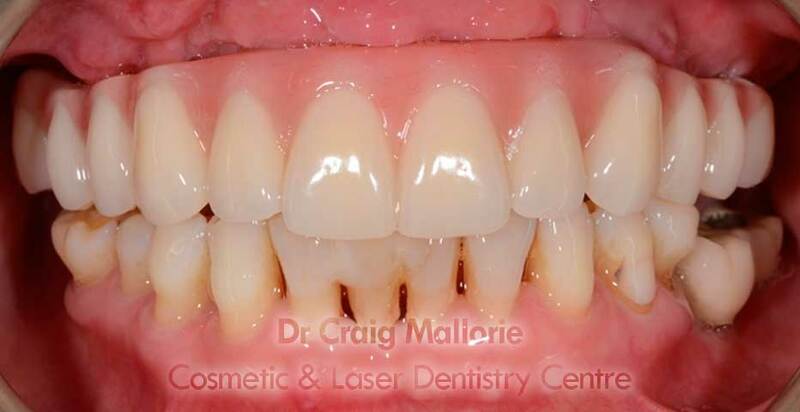 This patient now has a beautiful, functional, full smile again, and does not need to worry about dentures. To arrange a consultation regarding the All-on-4 treatmen, or any other enquiry, please phone our centre on (03) 9500 2084 today.